The April issue is in the mail now! 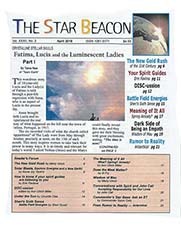 Earth Star's #1 BEST SELLER! The wondrous story of 10-yr.-old Lucia and the Lady(s) of Fatima, told through a past-life regression with a woman named Anna. "Pine Bush Report" and comments from Mara Edwards and Sara Hockenbery. In case you haven't heard, there's a new "gold rush" occurring right now and it's been active for the last five years. SOLAR BLASTS, EQUINOX ENERGIES AND A NEW EARTH! Is Anything possible? What would YOUR life look like it if it was? Do our guides even know what we want? Can they hear us? How do we know if they are really listening? "Accepting Full Responsibility for Our Lives"
There has long been a controversy concerning adding meat to our diets, and some feel this is a barbaric practice. Aside from my own survival, I am an Empath, or someone who, in almost all situations, puts others before themselves. What is going on in Antarctica? And more. The April 2018 issue also contains classified ads and other intriguing tidbits of information you won't want to miss.